I cut out some shapes from my scraps and old magazines, added a few alphabet stickers and some sparkly bits that came in a wedding invite long ago. To make it interesting for the little one, i separated them into categories and placed them in colourful silicone baking cups. 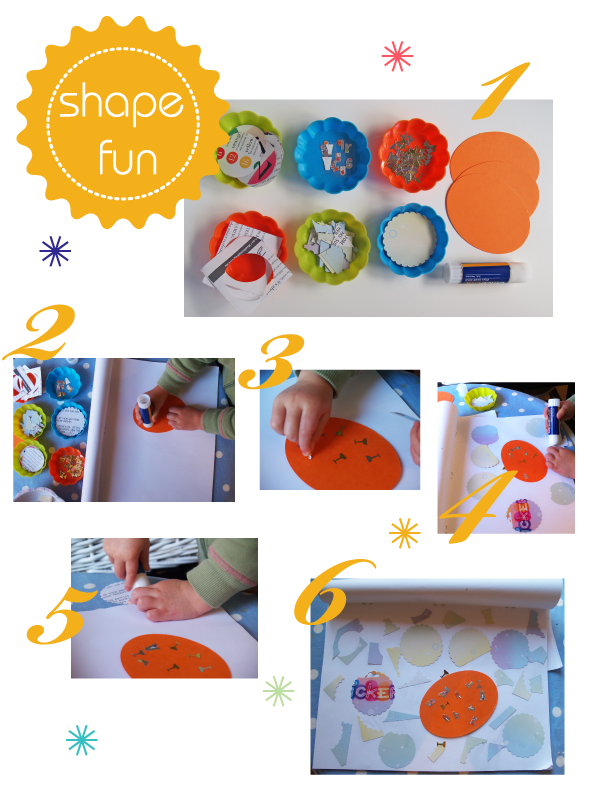 The idea was to create a colourful collage of shapes. She loved it, and spent a good 20 minutes on the project until there was pretty much nothing left in the little cups. A fair amount did find its way onto the floor. I think its really helpful to hold onto pieces of card and paper from empty food boxes or old cards so long as it has interesting colours and patterns. It saves having to go out and buy expensive coloured card and paper. Now just incase any of you are wondering, i don’t hoard all my rubbish in a secret room in the house with a sea of cereal boxes and junk mail pamphlets, with the hope that each one may find a happy and creative place in a child’s craft activity. Stocking up the kid’s craft cupboard (moonmum.typepad.com) – I love this idea of creating an area where the little ones have free access to creative bits and bobs, something to think about when my treasure is older- right now she will use up everything in one go.